Apparently, the force is much stronger in Los Angeles than it is in San Francisco. Star Wars creator and beloved filmmaker George Lucas recently announced he has chosen the City of Angels as the location for the $1 billion Lucas Museum of Narrative Art. Although the project is very much in the beginning phases, Lucas has tapped Chinese architectural firm Mad Architects to lead the design, which, at first glance, looks like it will be a futuristic design surrounded by acres of sprawling green space. The much-anticipated museum will be located in L.A.’s Exposition Park, holding court along side the California Science Center, Natural History Museum of Los Angeles County and California African-American Museum. It will also be adjacent to the director’s alma mater, the University of Southern California. As far as the content of the museum goes, the one-of-a-kind collections will be divided into three categories, namely narrative art, the art of cinema and digital art. The exhibitions will include everything from fine art and popular art to illustrations and comics, and of course, props and storyboards from the director’s iconic movies. Apparently, the force is much stronger in Los Angeles than it is in San Francisco. 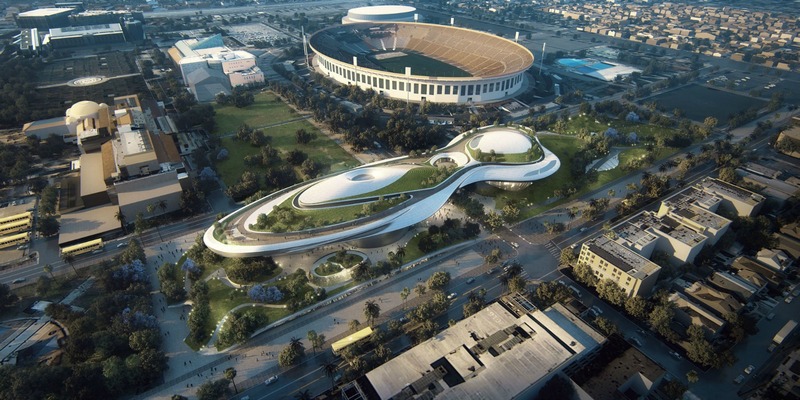 Star Wars creator and beloved filmmaker, George Lucas has recently announced that he has chosen the City of Angels as the location for the $1 billion Lucas Museum of Narrative Art. Although very much in the beginning phases, Lucas has tapped Chinese architectural firm Mad Architects to helm the project, which, at first glance, looks like it will be a futuristic design surrounded by acres of sprawling green space. The much-anticipated museum will be located in L.A.'s Exposition Park.